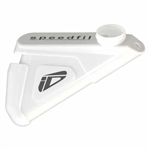 This clip works with the Speedfil A2 or can be attached to your aerobar extensions/handlebars to hold the Speedfil Standard or F2 drink tube. The Speedfil F2 works with any Specialized thread compatible standard water bottle. Features a dual splash resistant design allows the rider to refill the system on the fly,a s well as a bite valve and tubing keep fluid on demand without sucking up air for each drink. Includes the Speedfil Z4+ BTA Waterbottle cage and Speedfil A2 Waterbottle. The Speedfil A2 system works with any Specialized thread compatible water bottle in both 21 and 24 ounce sizes. The wind tunnel developed A2 model is designed to be used with triathlon/TT aerobars. The patent pending Zerosplash technology virtually eliminates fluid splashing. This design allows for rapid refilling on the fly, hands free drinking and easy cleaning. Mount not included. The new patent pending Speedfil Z4 Cage is the first cage optimized for BTA (Between-The-Arms) aero hydration. The Z4+ is specifically designed to be used in conjunction with the Speedfil A2. The Z4+ includes a non-slip strap that locks your A2 in place and prevents the system from rotating. Most versatile rear hydration carrier on the market. Adapts to any rider and any saddle. Contains both Dual and single mount options for training and racing. The Dual option allows for two CO2 Cartridge storage. Includes one Speedfil F2 System and one Speedfil Micro Retractor. Includes 2 Speedfil Z4 Cages, 1 Garmin Speedfil Adapter Arm and 1 R3 Single Mount. Replacement gasket for the Speedfil Hydration System. The R3 seatpost mount is designed specifically to be compatible with the R3 and Cervelo 2-hole seatposts. The kit includes one mount, two stainless steel bolts with nylon lock nuts. R3 Single Rear Carrier : Wind tunnel developed, the Speedfil R3 single puts your rear hydration in the optimum aerodynamic location for each rider’s unique body position and riding style. The R3 single contains a single mount with hardware and Z4 cage (bottle shown but not included). Adapter kit fits Pioneer SGX-CA500 cycle computer and is intended to be used with Speedfil Z4/Z4+ or any Garmin Quarter Turn compatible computer mount. 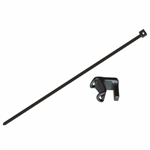 Replacement Garmin arm for Speedfil Z4/Z4+ cages. Replacement hardware for the Speedfil Hydration System. The patent pending Zerosplash is designed specifically for the Speedfil A2 but is also compatible with the Speedfil F2 as well as Speedfil's standard systems. The A2 Elbow & Gasket kit includes 90 degree elbow, adapter o-ring and ring-cap gasket. The Speedfil Micro-Retractor is great addition to hands free drinking that can be used with all your Speedfil hydration systems. Replacement cage for Speedfil Z4 and Z4+ Systems. Replacement cap for the Speedfil Hydration System, A2, and F2. Keep fluids cold with the A2/F2 SpeedSok. This neoprene sock fits securely over your A2/F2 or any standard water bottle to provide an easy solution to maintaining cold fluids. Bottles not included. The Speedfil A2 Garmin adapter allows for a single Garmin bike computer to mount on top of a Speedfil A2 where the data is easily viewable and easily accessible and the Tube clip keeps drink tube out of the wind! Speedfil A2 & Garmin Computer not included. The new patent pending Speedfil Z4 Cage is the first cage optimized for BTA (Between-The-Arms) aero hydration. The Z4 Cage works with standard water bottles. Replacement Tube and Sleeve for the Speedfil Hydration System. Includes the Standard Speedfil system and one Neoprene Speedsock. Includes one Speedfil A2 system and one A2 stem mount. The A2 Stem Mount Kit allows you to attach your Speedfil A2 or spare water bottle right on to your stem cap. This mount can be set up in multiple configurations as to allow for optimum cage/bottle placement. 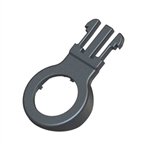 This Speedfil Seat tube mount kit is required for bicycles that DO NOT have bottle cage mounts on the frame down tube. 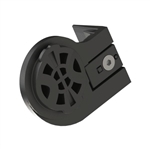 Replacement bite valve for the Speedfil Hydration System. Replacement funnel, gasket and cap for the Speedfil Hydration System. The Speedfil Neoprene SpeedSock keeps fluids cold for 2-3 hours. This neoprene sock fits securely over your Speedfil Hydration System to provide an easy solution to maintaining cold fluids. The revolutionary Speedfil Hydration System gives triathletes and cyclists the advantage to hydrate, ride and race faster on the bike. This Speedfil is compatible with bicycles that are equipped with "seat tube only" cage mounts.